I just got off the phone with someone and after sharing this with her, she said ‘Wow, just that one sentence really enlightened me!’ So if this can enlighten you, I’ll be happy that my job is done. So let’s say that you have a studio and I am speaking specifically to running group sessions. 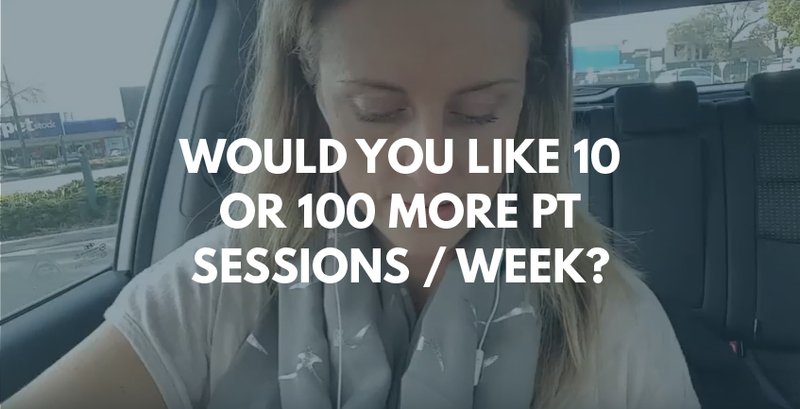 I don’t care if you want to fill up your classes during the week with 10 or 100 extra sessions or people. The 9.30am people are often completely different (in their life situations) to the 6am people. I know there is a cross over and people move around but stick with me for a moment. And the 6am people are different to the 6-P-M people. So your marketing needs to be different too. I know that they can cross over sometimes and people move session times etc. However, whatever marketing you put out there needs to be specific to that time slot. If you’re trying to talk to heaps of people, you’re actually going to miss everybody. Eg, don’t make a promotion for mums that are at home looking after young children, the same way you’d make a promotion for busy male executives. One may be the 9.30am crowd, the other the 6am or 7pm crowd. There’s a really important rule in marketing: One piece of marketing (think one of your posts on social media or your blog) needs to speak to ONE person. It must NOT try to speak to 100,000 people, not even 100. If your message is that broad, it doesn’t hit ANYONE. This was a HUGE wakeup call for me in my fatloss business. Since learning this I was able to get really creative but specific and develop programs for ‘Post Natal Women’ and actually attract them by marketing each service accordingly, vs, a program specifically for ‘Menopausal’ women. Now, broad marketing like what I have mentioned here used to work. Before people’s eyes glazed over and you didn’t need to stand out as much. As little as five years ago at the time of writing this, in the online space, it worked, a little bit. But it doesn’t anymore. You have probably realized this yourself… Do you post to your business or personal page and the posts don’t get much traction? Then you know what I mean. Another example is it’s harder to market a ‘Metafit’ and/or a cardio jumping classes to mum’s who’ve just had babies – they are probably scared of bladder leakage when they jump. That’s just not pleasing for their needs and desires. If you do market these types of classes for mums then make sure you specifically tell us WHAT the benefits are for the person and make it relatable to THEIR goals. So be really specific. And remember to be really helpful with your content as well. Don’t forget that content is part of the plan – you can’t just put up posts that focus on ‘buy my stuff’ or ‘do my challenge’ every day. Offer value to your followers. That is the key to standing out and gaining followers who buy from you. Engage them with HELPFUL, informative or entertaining content. Again, targeted at a very specific group or problem. This leads to helping your build your personal training business far beyond what you thought possible. Wouldn’t that be helpful? Having too many clients and having to outsource more of your work. Do you have questions in relation to any of this?